Hardwood finish flooring; narrow tongue-and-groove strips; commonly maple, mahogany, oak, etc. Spring and a new road concrete flooring strips Street. These components include: S2S and S4S dimension blanks, flooring strips, moulding blanks, edge-glued panels, solid and laminated squares, dowels, mouldings, turnings, table and chair parts, cabinet doors and parts, frame stock, staircase parts, interior trim, millwork, engineered wood components, and many other specialty wood products. An important problem encountered with prefinished flooring strips is surface checking. Left on the floor too long, the etcher can seep into cracks between flooring strips and damage the core of laminated flooring. One-day floor revival: restore your wood floor on a Saturday--and still have time to play! Tricon geared up to process trees as small as 3 inches in diameter into one-inch-thick flooring strips. When the design team wanted to replace Landmark Guest Rooms' flooring strips - smaller than 2-1/4 inches wide - green fir wood flooring strips were custom-milled on-site. The purpose of this document is to establish the conditions under which will be carried out the supply and delivery of flooring strips for ICF Habitat group. These components include S2S and S4S dimension blanks, flooring strips, moulding blanks, edge-glued panels, solid and laminated squares, dowels, mouldings, turnings, table and chair parts, cabinet doors and parts, frame stock, staircase parts, interior trim, millwork, engineered wood components and many other specialty wood products. A sealed box containing air at a given temperature and relative humidity (RH) is placed over 120-cm by 12[degrees]-cm assembled flooring strips to obtain a water vapor movement only through the top surface. The cracks between flooring strips are dark, so they stand out vividly against a light-colored floor, much to the owner's disappointment. Founded in 1989, Wickham Hardwood Flooring is a global enterprise specialized in the manufacture of hardwood flooring strips. 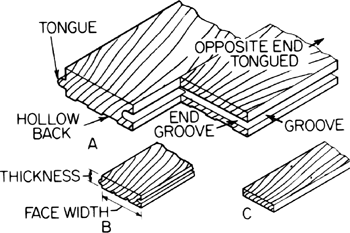 The system involves pushing the tongue and groove of two flooring strips together at a 20 to 50 degree angle.